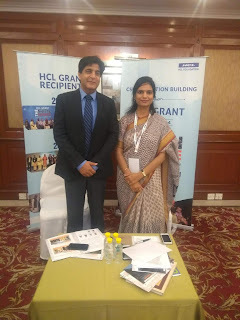 HCL Foundation, the CSR arm of HCL Technologies today hosted the eleventh symposium in the series at India Habitat Centre, Jacaranda Hall in Delhi. The day-long event was attended by eminent personalities such as Ms. Seema Chaudhary – Editor, HT Live mint– Heads the CSR section, Mr. Kamal Singh – Executive Director, UN Global Compact Network India, Ms. Verity Corbett, Development Sector Expert and Mr. Varun Vidyarthi, Founder , Manavodaya Institute of Participatory Development. HCL Foundation hosted the various sessions where NGO’s working in the areas of health, environment, education, Livelihood etc. attended the sessions and shared their experiences and challenges. The symposiums in series so far in 10 cities - Hyderabad, Jammu, Pune, Bhopal, Ranchi, Coimbatore, Udaipur, Vadodara, Dehradun and Bangalore received a tremendous response in terms of NGO’s coming forward and showcasing their work models towards the development of the society. 180 participants attended the event representing many parts of the state. In year one, 11 symposiums were held in cities like Kolkata, Mumbai, Patna, Raipur, Guwahati, Chandigarh, Imphal, Jaipur, Vijayawada and Bhubaneshwar amongst other. As part of the capacity building initiatives, panel discussions and open house sessions were conducted with local NGO representatives and civil society experts on themes such as - Strategizing CSR to achieve Sustainable Development Goals: Global to Local and Challenges and Opportunities for local area development: Education, Health & Environment. The Symposiums will also be held in 01 other location namely - Itanagar. Through this commitment, the HCL Grant supported projects selected during Edition 1, 2 3 & 4 aim to cover 9,11,736 people in 3,567 villages in 26 districts across 12 states of India of which the projects have already covered 2,07,121 beneficiaries. These projects are already operational in the states of Bihar, Uttar Pradesh, Rajasthan, Gujarat, West Bengal, Karnataka, Andhra Pradesh, Odisha, Jharkhand, Maharashtra, Tamil Nadu and Nagaland. HCL Grant awards the winning NGOs in each of the categories of Education, Health and Environment ₹ 5 crore for a 5 years project. From this year, the Grant would like to reward the other finalists too, who are doing great work in their own right. So the 2 other finalists in each category will receive ₹ 25 lakhs for a 1 year project which will be mutually agreed with HCL Foundation after the final Jury meet. Thus, the total committed fund for HCL Grant is ₹16.5 Crores for the year 2018 – 19.